The Metropolitan Boutique series further defines Wesier by continuing the renaissance of the Metropolitan style that can be seen reflected in some of today's hottest boutique hotels. These clean lines, geometric shapes and grayed colours are all based on this significant 1930s school of design. 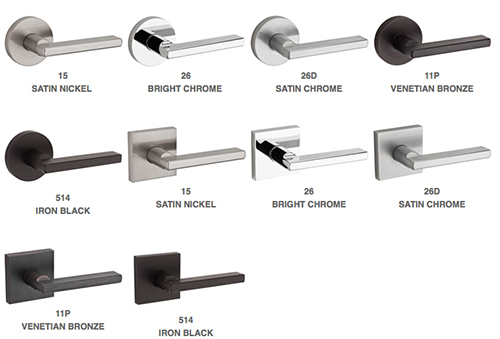 The Halifax lever was designed with input from Canada's most influential interior design firms. 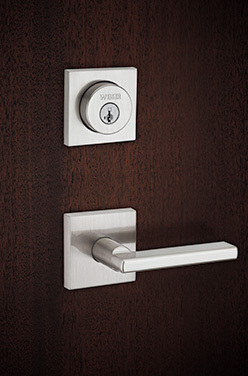 With their design cues the Halifax lever is one of the new hardware series based on the square spindle. Some levers are "handed", which means you need to consider which way your door swings for the lever to curve up or down in the correct direction. Weiser levers are fully reversible so they're easy to install and give you one less thing to worry about. Solid Construction - Feel the difference of solid construction with Weiser hardware. Lifetime Warranty - We guarantee the beauty of our finishes and the performance of our craftsmanship. Are you looking for the Halifax Lever (Round)? •Available with round or square rose. A "rose" is the circular plate surrounding the knob or lever that's flush against the door.